Are you ready to learn about implementing and modifying Respiratory Care plans? If so, you’re in the right place and this study guide is for you. 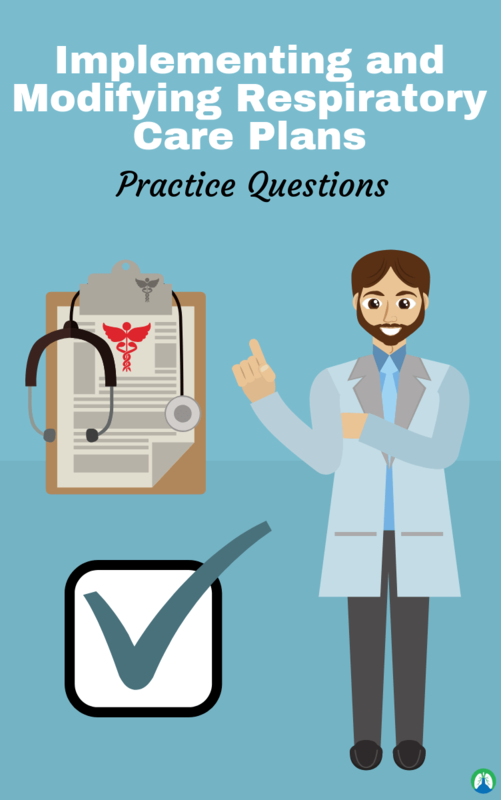 The practice questions listed below will help you develop a good understanding of this topic. This information correlates well with Patient Assessment Chapter 2 in Respiratory Therapy school. So enough blabbering from me. Are you ready to get started? If so, let’s dive in! 1. How do respiratory care plans work? They are similar to respiratory therapy protocols. They use a multidisciplinary plan to provide patient care. They can be used in acute, sub-acute and rehabilitation facilities. They rely on communication from all involved medical professionals. This includes a daily or weekly meeting with all involved services. 2. Respiratory care plans use the information from an assessment to determine what? Type, frequency, and the goals of therapy. 3. What are the other names for Respiratory Care plans? Critical pathway, Clinical algorithms, Practice plans, Multidisciplinary action plans, and Care maps. 4. How did Care plans originate? They originated in the construction and manufacturing industries (helps keep a timeline). 5. What is the 80/20 rule? 80% of patients will fall into care plan and benefit from the plan. 20% will fall outside the plan and need additional resources. 6. What are the advantages of care plans? Helps shorten patient’s length of stay. It also helps hospitals with continuous quality improvement (CQI). Easy to follow a patient’s progress and setbacks with a patient’s condition. Team members get a valuable insight as to their importance in the health care team. 7. What are the limitations to care plans? They take a lot of resources to develop. Must allow for adequate training of hospital personnel. Cost savings for the patient if the length of stay is decreased but the training and meeting are costly for the hospital. Care plans are specific to each institution. Need firm commitment from leadership to be successful. It may overlap with protocols and CPG’s. 8. What are the most common indicators of a care plan’s outcome? Morbidity and Mortality rates. Evaluation should include complications. 9. What are the most common concerns about care plans? 10. What leads to better patient outcomes? 11. What are the characteristics that will improve patient outcomes? Patient-centered focus – greater autonomy in patient care, strong leadership – participation in decisions, supportive visible leaders, a collaborative approach, and effective communication. 12. What can alert health care providers for the need to change the patient’s care plans or protocols? 13. What does variance tracking require? Timely intervention to achieve an outcome (improve the patient’s condition). 14. What is a downfall of variance tracking? May make clinicians hesitant to change patient care plan in fear of internal audit system (CQI). Also affects the patient’s (LOS) Level of service. 15. What are the questions to ask for beneficial outcomes? Is the patient better-off because of the treatment plan? Also, Is the quality of life improved or maintained, or has it declined? Lastly, Can the patient self-manage the disease and demonstrate health-promoting behaviors? 16. What is the multidisciplinary task force, and how is it set up? Meeting of all involved services to discuss care plan (usually weekly). Members of the committee should speak on behalf of other members of that service (same goals). Members should have knowledge of patients care plan and progress. Patients’ RN or MD usually serves as chairperson for the meeting. Members of hospital administration and hospital ‘s QA department also may attend. 17. What services do you want to have incorporated into your care plan meetings? Relies on communication from all involved services (RT, PT, OT, RN, MD). Increasing EPAP to 10 and IPAP to 25 cm H2O. 19. A patient with COPD is receiving heated water aerosol treatments via a jet nebulizer QID in order to aid in mobilizing retained secretions. After each treatment, you note a significant increase in tactile fremitus and rhonchi. Which of the following recommendations would you make to the physician? Add coughing and postural drainage to the therapy. 20. A doctor asks you to evaluate if an adult patient receiving volume control SIMV with 40% O2 is ready for a spontaneous breathing trial (SBT). What are the following measures would support a decision to initiate an SBT? Pulse Sat/ SpO2 91% and spontaneous breathing. 21. A 45-year-old patient with asthma is prescribed 0.3 mL of albuterol (Proventil) in 3 mL normal saline via small volume nebulizer. Before initiating therapy, you note from chart review that the patient is severely hypertensive and has been experiencing episodes of super ventricular tachycardia. What you should do? Postpone the treatment and consult the physician. 22. For which of the following conditions causing acute respiratory failure would you recommend noninvasive positive pressure ventilation (NPPV)? 23. After PEEP was changed from 5 cm H2O to 10 cm H2O, a patient’s blood pressure dropped from 120/80 mm Hg to 100/70 mm Hg, and the SpO2 increased from 87% to 91% with an FIO2 of 0.60. What you should do? Maintain PEEP at 10 cm H2O. 24. An ICU nurse calls to the bedside of a patient receiving volume controlled SIMV via a tracheostomy tube. The patient is exhibiting signs of respiratory distress and several alarms are sounding together. What will be your first action? Remove the patient from the ventilator and bag with 100% oxygen. 25. A 2-year-old child with a 24-hour history of an upper respiratory infection and low-grade fever is admitted to the Emergency Department with audible inspiratory stridor. The stridor did not improve after cool bland aerosol therapy treatment. What should be the recommended aerosol administration? 26. While administering an IPPB treatment to a post-op abdominal surgery patient, you note that her neck veins become distended and her heart rate increases and becomes a bit irregular. What action would you take at this time? Stop the treatment and monitor the patient. 27. An asthmatic patient who is prescribed MDI albuterol (Proventil) q6h complains that she develops wheezing an hour or two before scheduled treatments. What is the appropriate action? 28. Soon after you initiate postural drainage in a Trendelenburg position, the patient develops a vigorous and productive cough. What is the appropriate action currently? 29. A 65-year-old male patient with COPD is in the emergency department is receiving oxygen therapy by nasal cannula at 6 L/min, with an SpO2 of 98%. He was talkative on admission but is becoming sleepy after 1 hour of O2 therapy. What is the most appropriate action to do? Switch to a 24% air-entrainment mask. 30. You are working with a 55-year-old patient who had open heart surgery yesterday. He is awake and has stable vital signs and acceptable weaning parameters. After breathing spontaneously on a T-piece for 30 minutes, he starts to bleed heavily through his mediastinal chest tube. The nurse checks his vital signs and determines that his blood pressure is 90/50 mm Hg, heart rate is 130 beats/min, and respiratory rate is 28 breaths/min. What will be the best action at this time? Place him back on the ventilator. 31. You measure an SpO2 of 82% on a patient receiving oxygen at 3 L/min via nasal cannula. What will be the appropriate action for this case? Increase the cannula liter flow to 4 L/min. 32. A patient admitted to the emergency department has severe facial trauma that involves both the nose and mouth. Which of the following routes would you recommend protecting his airway and provide positive pressure ventilation? 33. You find it difficult to initiate a spontaneous breathing trial (SBT) on a patient who was heavily sedated with midazolam (Versed) and remains stuporous. What drug agent would you recommend reversing the action of the midazolam so that you can proceed with the SBT? 34. When 15 cm H2O PEEP is initiated, a patient’s cardiac output decreases from 4 to 2 L/min. Which of the following actions would be appropriate? Decrease PEEP to 10 cm H2O and recheck the cardiac output. 35. A patient is receiving postural drainage and percussion in the Trendelenburg position. Therapy should be terminated if which of the following develops? 36. A patient with idiopathic pulmonary hypertension who exhibits dyspnea at rest and signs of right-heart failure is unable to carry out any physical activity without symptoms. Which of the following drugs would you recommend for this patient? 37. What treatment would you recommend for a patient who has a 50% spontaneous pneumothorax? Inserting of a chest tube. 38. An ICU patient receiving ventilatory support is suspected of having a tension pneumothorax. What would you recommend? Get chest X-ray/prepare for thoracostomy. 39. A physician has ordered an aerosol treatment with 4 mL acetylcysteine (Mucomyst), 20% concentration. The patient develops end-expiratory wheezes. What would you do? Discontinue therapy and notify the physician. 40. A physician wants to apply high PEEP levels (30 cm H2O) to a patient receiving volume control ventilation (assist-control). What would you recommend in order to minimize the effect of the high-level PEEP on this patient’s cardiovascular system? Switch the patient to the SIMV mode. 41. The intracranial pressure (ICP) of a patient with closed head trauma receiving volume control A/C ventilation has risen from 18 mmHg to 26 mmHg despite aggressive treatment with osmotic diuresis, CSF fluid drainage, sedation, and neuromuscular blockade. What short-term ventilatory strategies would you recommend helping manage this patient? 42. The patient is awake, appears anxious, is agitated and often breathing out of phase with the ventilator. What would you recommend? 43. During noninvasive ventilation (NPPV) via nasal mask, the patient’s mouth is wide open, and the device fails to reach the set inspiratory pressure. What modification would you recommend resolving this problem? 44. Which of the following types of positive expiratory pressure (PEP) devices would you recommend for a patient if the goal is to help mobilize retained secretions? A PEP device that provides high-frequency vibrations. 45. A newborn infant will require a precise and stable FIO2 for at least 5-7 days. Which of the following devices would you recommend providing O2 to this infant? 46. A doctor wants an outpatient with idiopathic pulmonary hypertension to self-administer an inhaled pulmonary vasodilator. What drugs would you recommend? 47. A patient with asthma who is receiving an albuterol (Proventil) treatment via small volume nebulizer every six hours complains of wheezing before the next treatment. What would you recommend? Increasing the frequency of administration. 48. A physician orders 2 L/min O2 via simple mask to a 33-year-old post-op female patient with moderate hypoxemia breathing room air (PaO2 = 52 mm Hg). What would be the correct action at this time? Recommend a flow of at least 5 L/min to wash out CO2. 49. To remove accumulations of subglottic secretions from above the cuff of intubated patients. What would you recommend? Use of a tracheal tube with a suction port above the cuff. 50. You are asked to assess a 34-year-old homeless man admitted through the ER with an abrupt onset of chills and fever. He has bilateral rhonchi with a productive cough. His SpO2 is 88% on room air. What should you recommend? Provide O2 therapy, give an antibiotic, and obtain sputum for C&S. 51. A patient with a history of congestive heart failure is admitted to the ED with severe dyspnea, wheezing and watery, pink secretions. A first-year resident order supplemental O2 and albuterol (Proventil) via SVN. What you should do? Recommend diuresis and CPAP/BiPAP with oxygen instead of albuterol. 52. For which of the following patients receiving mechanical ventilation would you recommend adding or increasing PEEP? PaO2 is less than 60 torr on an FIO2 greater than 0.60. 53. During an aerosol treatment with 1.0 mL of albuterol (Proventil) and 3 mL of saline, you note that the patient’s pulse has increased from 86 to 120/min. What is the most appropriate action for this? Stop the treatment and recommend a lower dose of albuterol. 54. After weaning and extubation, a patient on a cool aerosol mask at 40% O2 develops moderate hypoxemia and hypercapnia, with a falling pH. What would you recommend as a next action? Apply bi-level positive airway pressure via mask. 55. Which of the methods would you recommend for prophylactic administration of surfactant to a newborn infant? Intubation, surfactant instillation, prompt extubation to nasal CPAP. 56. Why would you recommend placement of an artificial tracheal airway? To protect against pulmonary aspiration. 57. A patient with a restrictive disorder develops hypercapnic respiratory failure. Prior to intubation, her breathing rate is 28/min. After being placed on volume-control A/C ventilation, her blood gas indicates respiratory alkalosis (pH=7.54). What would you recommend? 58. While assessing a patient receiving volume-controlled A/C ventilation, you notice that the peak pressure has increased 10 cm H2O over the last hour. The plateau pressure has not changed. You also notice that the patient has significant wheezing in both lungs that was not present earlier. What would you recommend? 59. You are asked to recommend a bronchodilator for a patient suffering an acute asthmatic attack. What should be considered when choosing albuterol (Proventil)? It has a relatively rapid onset. Also, it has minimal beta-1 side effects. 60. You are called to the post-anesthesia recovery room to setup an unconscious, apneic postop patient on volume control ventilation (assist-control) at 12 breaths/min. Soon after initiation of support, you obtain normal arterial blood gas results. When you return one hour later, you find the patient awake, alert, and triggering the ventilator at 22/min. What would be the appropriate action at this time? Change over to the SIMV mode. 61. An 18-year-old track star just won the state 100-meter dash. Upon completion of the race, he became short of breath, coughed up small amounts of mucoid sputum and was wheezing. He enters the ER anxious and diaphoretic. What action is appropriate in this case? 62. Which of the following pulmonary vasodilators can be administered via the inhalation route? 63. A home care patient with COPD has persistent dyspnea and exhibits signs of increased work of breathing even at rest, but little or no wheezing. The patient currently is receiving no medication. What drug would you recommend for this patient? Theophylline (Theo-Dur) 150 mg tab bid. 64. A COPD patient receiving volume-controlled A/C ventilation develops auto-PEEP of 8-10 cm H2O. Which of the following would you recommend correcting this problem? 65. Which of the following secretion clearance methods would you recommend for a home care patient who lives alone? 66. Your pharmacy stocks Mucomyst only in 20% vials (10 mL). The doctor orders 4 mL of 10% Mucomyst with Albuterol for a patient with chronic bronchitis. What volume of 20% Mucomyst and saline would you mix together to provide the desired dosage? 2 mL Mucomyst/2 mL saline. 67. If a patient’s pulse rate increases by 40 per minute during a respiratory therapy treatment, what should you do? Terminate the treatment and notify the physician. 68. Which of the following medication you would recommend to help quiet an ICU patient who is breathing asynchronously on a ventilator? 69. A patient receiving volume control SIMV with 8 cm H2O PEEP and 40% oxygen has a PaO2 of 62 torr and a SaO2 of 89%. The patient’s doctor requests that you increase the PEEP to 12 cm H2O. What you should do? Recommend raising the FIO2, not PEEP. 70. A patient with chronic bronchitis is receiving volume-controlled A/C ventilation. Wheezing is heard over all lung fields, bronchial fremitus is felt over the central airways, and secretions are thick. The patient’s peak pressure is 45 cm H2O and plateau pressure are 20 cm H2O. What would be useful to treat the patient’s condition? 71. The repeated administration of beclomethasone (Vanceril) by inhalation is associated with what adverse effects? 72. Prior to beginning an adrenergic aerosol bronchodilator treatment on an adult patient, you record a resting heart rate of 132/min. What would be the correct action in this case? Postpone therapy until able to contact the ordering physician. 73. A 87-year-old nursing home patient is admitted with pneumonia. On assessment the patient presents with a 103.2 °F temperature, dry mucous membranes, urine output of 10 mL/hr. for the past two hours, mild hypotension, and increased hematocrit on his CBC. What would you recommend to the ER physician? 74. You are administering an aerosolized albuterol (Proventil) treatment to a patient when you note he complains of dizziness, heart palpitations and feeling flushed. What would your next action? Stop the therapy, monitor the patient and inform the patient’s doctor. 75. Theophylline therapy would tend to increase the risk of exacerbating of what condition? 76. You have been asked to recommend the best airway for an alert, conscious patient who needs frequent tracheal suctioning. What airways would you recommend for this patient? 77. While monitoring a patient during a spontaneous breathing trial via T-tube, you note the following: an increase in heart rate from 85 to 103/min; an increase in respiratory rate from 14 to 34/min with increasing accessory muscle use; an increase in PetO2 from 44 to 56 mm Hg; and a decrease in SpO2 from 93 to 87%. What action would be appropriate at this time? Restore the patient to full ventilatory support. 78. What are the conditions would you recommend that the patient receive supplemental O2 therapy? Smoke inhalation, severe trauma, and cardiogenic shock. 79. A home care patient with COPD who lives alone produces in excess of 30 mL of sputum daily and is having difficulty clearing his airway. What therapy would you recommend for this patient? PEP therapy followed by autogenic drainage PRN. 80. Following administration of a bland aerosol treatment, coarse rhonchi are detected upon auscultation. What you should recommend? Encourage the patient to cough. 81. While monitoring a patient during a spontaneous breathing trial via T-tube, you note the following: an increase in heart rate from 85 to 103/min; an increase in respiratory rate from 19 to 26/min; an increase in PetO2 from 44 to 52 mm Hg; and a decrease in SpO2 from 94 to 90%. What action would be appropriate at this time? Encourage the patient to relax and continue monitoring. 82. A nurse complains that her trach patient’s secretions are thick and difficult to suction. You note that the patient is receiving 40% oxygen via a jet nebulizer and tracheotomy collar and that the secretions appear mucoid in nature. You also note a lack of skin turgor and dry/cracked lips. What would you recommend in this case? 83. While performing incentive spirometry, a patient with two rib fractures on the right side complains of severe pain on inspiration in the area of the fractures. What you should do? Stop the therapy, stay with the patient, call for assistance. 84. What purposes would you recommend pressure support ventilation (PSV)? To assist patient during spontaneous breathing trials. 85. A patient with a size 8 tracheostomy tube is being suctioned by the nurse. While suctioning the patient you observe several PVCs on the patient’s monitor. What would you recommend the nurse? Pre-oxygenate the patient with 100% O2. 86. You are administering chest physical therapy in the Trendelenburg position to a 68-year-old male patient with chronic bronchitis. The patient starts to cough up a small amount of fresh blood. What action should you take? Stop the therapy, stabilize the patient up and contact a physician. 87. An intubated patient in ICU receiving inverse ratio pressure control ventilation needs continuous long-term sedation. What agent would you recommend for this patient? 88. What would you recommend to a patient against the administration of a leukotriene modifier like zileuton (Zyflo)? With status asthmaticus and active liver disease. 89. Trauma patient has been receiving volume control SIMV via an oral endotracheal tube for a week. Based on the patient’s current condition, there is little likelihood that weaning will be considered for at least another 7-10 days. What action would you recommend? Switch from ET intubation to tracheostomy. 90. Midway through an aerosol drug treatment via SVN, a patient complains of dizziness and palpitations. After stopping the therapy, you should record which of the following on the chart? Drug and dose administered and vital signs pre/post treatment Problem description/how corrected. 91. You note in reviewing the chart of a COPD patient that his serum theophylline level is 25 mcg/mL. He is complaining of a headache and insomnia. What would you recommend? 92. What is the criteria for discontinuing attempts at noninvasive positive pressure ventilation (NPPV) and instituting alternative therapies? 93. A motor vehicle accident victim with severe facial trauma is brought into the emergency room. The patient is alert and responsive, but in respiratory distress due to severe upper airway obstruction. What would you recommend? 94. After 10 minutes IPPB therapy, a patient complains of fatigue. On assessment of the patient, you note increased use of the accessory muscles of ventilation and an increase in respiratory rate from 13 to 29/min. What would be the appropriate action at this time? Stop the treatment and stay with the patient until she improves. 95. A patient with idiopathic pulmonary hypertension is comfortable at rest but develops dyspnea and chest pain when engaging in ordinary physical activity. What drugs would you recommend for this patient? An oral PDE inhibitor such as sildenafil (Revatio) and tadalafil (Adcirca). 96. A patient receiving pressure control SIMV at a mandatory rate of 14/min has the following ABGs on an FIO2 of 0.45: pH=7.58; PCO2=21 torr; PO2=88 torr. The physician requests that you try to normalize the pH. What action would be appropriate? Decrease the mandatory (machine) rate. 97. Immediately after endotracheal tube extubation, an adult patient exhibits a high-pitched inspiratory noise, heard without a stethoscope. What action would you recommend? STAT racemic epinephrine aerosol treatment. 98. The PRIMARY indication for aerosolized ribavirin (Virazole) is in what treatment? 99. A newborn infant receiving a moderate concentration of O2 in an isolette must be removed in order to insert an umbilical artery catheter. What device would you recommend providing supplemental O2 to the infant during this procedure? 100. Which categories of patients would recommend using auto-CPAP? Patients with obstructive sleep apnea. 101. What would you recommend for a patient with emphysema who experiences hypoxemia at rest? 102. Following an allergic reaction to a bee sting, an adult patient needed endotracheal intubation. The tube is removed 3 days later. 10 minutes after extubation, the patient develops inspiratory stridor and dyspnea. What should you recommend? 103. A known COPD patient is receiving oxygen at 2 L/min via nasal cannula. An ABG on that setting reveals a PaO2 of 59. A new medical resident orders the patient’s oxygen low be increased to 6 L/min. What is the best course of action for you to take? 104. While given an adrenergic aerosol bronchodilator treatment to an adult patient, you notice an increase in pulse rate from 85/min (pre-treatment) to 125/min. What would be the correct action in this case? Terminate the treatment and record adverse response in the chart. 105. A 52-year-old male is admitted to the hospital emergency room with a chief complaint of severe radiating chest pain and signs of central cyanosis. The attending physician orders STAT O2 therapy. What would you recommend? Partial rebreathing mask at 10 L/min. 106. A patient receiving pressure control ventilation has the following ABGs on an FIO2 of 0.50: pH=7.35; PCO2=45 mm Hg; HCO3= 23 mEq/L; PaO2=170 mm Hg. What changes would be appropriate for this patient? 107. A nurse complains to you that a neuromuscular patient under her care cannot develop a good cough. What would you recommend as best able to aid this patient in clearing secretions? Combining mechanical insufflation/exsufflation with suctioning. 108. A patient requiring mechanical ventilation has her PEEP increased from 10 to 15 cm H2O. Within 20 minutes, her blood pressure has decreased, and heart rate has significantly increased. What actions should be taken at this time? Decrease the PEEP back to 10 cm H2O. 109. A patient with chronic hypercapnia is receiving 28% O2 via an air entrainment mask. The nurse indicates to you that this patient tends to become cyanotic and confused during meals. What action would you recommend? Recommend switching to a cannula at 2 L/min during meals. 110. An 80 kg patient in acute respiratory failure is intubated with a 6.5 mm ET tube and started on volume control SIMV mode at a rate of 12/min with 10 cm H2O PEEP. Soon thereafter, he exhibits paradoxical breathing and accessory muscle use, especially during spontaneous breaths. What changes would you recommend? Add 5-10 cm H2O pressure support. 111. A trauma patient has been receiving volume controlled SIMV via an endotracheal tube for a week. Based on the patient’s current condition, there is little likelihood that weaning will be considered for at least another seven days. What action would you recommend? Switch from oral intubation to tracheostomy. 112. A 54- year-old patient is admitted to the hospital with a diagnosis of cardiogenic pulmonary edema. His pulse is 130 and pounding, his respiratory rate is 35, with labored with shallow breaths. The PaO2 on a simple mask at 10 L/min is 48 torr and the PaCO2 is 30 torr. What change in therapy would you recommend for this patient? Initiate mask CPAP, initially with 100% oxygen. 113. You are asked to assess an adult sleep apnea patient receiving CPAP via nasal mask. The patient’s snoring is becoming progressively louder with longer periods of apnea. You should initially do which of the following? 114. By doctor order, a patient with bacterial pneumonia has received postural drainage and percussion to all lung segments four times a day for one week. The pneumonia has cleared in all segments except for the left lower lobe. At this time, what would you recommend? Limiting the therapy to the involved segments. 115. A patient suspected of an opiate narcotic overdose is barely breathing. What drug would you recommend increasing ventilation? 116. A doctor decides to provide heavy IV sedation to a patient in ICU who is receiving volume control A/C ventilation. You should be on guard of what side effects? 117. You would recommend continuous positive airway pressure (CPAP) to manage which one of the following problems? 118. A patient is admitted to the Emergency Department with severe upper airway trauma. Attempts to intubate the patient fail and you cannot ventilate him using a bag-mask resuscitator. What action would you recommend at this time? 119. A patient in ICU receiving noninvasive ventilation is agitated and having difficulty accepting the nasal interface. What medication would you recommend sedating this patient? 120. A patient is admitted to the emergency department with severe trauma to the upper airway, including the hypopharynx and larynx. Which type of airway would you recommend for this patient? 121. An intubated and mechanically ventilated patient is restless and fighting the ventilator. IV sedation has not been successful in calming the patient. What drug would you recommend assuring patient-ventilator synchrony? 122. Your patient had her spleen removed 2 days ago and is still reluctant to take a deep breath. The doctor asks for your recommendation to prevent the development of atelectasis. What would you suggest? 123. COPD patient receiving volume control SIMV with a VT = 500 mL, rate = 8/min, pressure support = 10 cm H2O and PEEP = 5 cm H2O undergoes a spontaneous breathing trial (SBT) via T-tube. After 5 minutes the patient must be placed back on the ventilator due to severe tachypnea. What approach would you recommend for the next SBT? Provide pressure support + CPAP via ET tube. 124. After completing an IPPB session with a 61-year-old patient who recently underwent major thoracic surgery, you note a significant deterioration in his vital signs. What would you do at this time? Remain with the patient and call for the attending nurse. 125. A patient with a restrictive disorder develops hypercapnic respiratory failure. Prior to intubation, her breathing rate is 28/min. After being placed on volume-control ventilation (assist/control), her ABGs indicate respiratory alkalosis (pH=7.51). What would you recommend? Switch the patient to the SIMV. 126. A paralyzed patient receiving volume-controlled A/C ventilation has an elevated PaCO2. The doctor wants to reduce the PaCO2 without changing the minute ventilation. What changes would you recommend? Increase the tidal volume and decrease the rate. 127. You are assisting in the treatment and evaluation of an opiate narcotic overdose patient in the ER who is hypoventilating. The physician asks you to recommend a drug to help reverse the effects of the narcotic and enable the patient’s breathing to return to normal. What drug would you recommend? 128. What aerosolized agents would you recommend facilitating airway clearance in a patient with cystic fibrosis (CF) who cannot tolerate DNase? 129. For what purpose would you recommend pressure support ventilation (PSV)? To boost spontaneous volumes during SIMV. 130. What would you consider modifying any head-down positions used for postural drainage for a patient with? 131. What method of ventilation would you recommend for a patient with a tracheotomy who requires home ventilatory support? 132. A patient receiving an aerosol treatment with a beta-agonist suddenly complains of lightheadedness and chest pain. The patient’s blood pressure is 180/110 mm Hg, the pulse is 120/min and irregular, and the respiratory rate is 28/min and labored. What action is appropriate currently? 133. A patient is receiving mucolytic aerosol therapy with acetylcysteine (Mucomyst) to help mobilize his secretions. Although effective toward this end, the patient tends to develop some persistent wheezing toward the end of his treatment sessions. What action would you recommend to the ordering physician? Add a bronchodilator to the treatment regimen. 134. What medication you would recommend helping quiet an ICU patient who is breathing asynchronously on a ventilator? So there you have it! That wraps up our study guide on implementing and modifying Respiratory care plans. I hope this information was helpful and I hope you can use these practice questions to grasp and fully learn this topic. Thank you so much for reading and as always, breathe easy my friend.